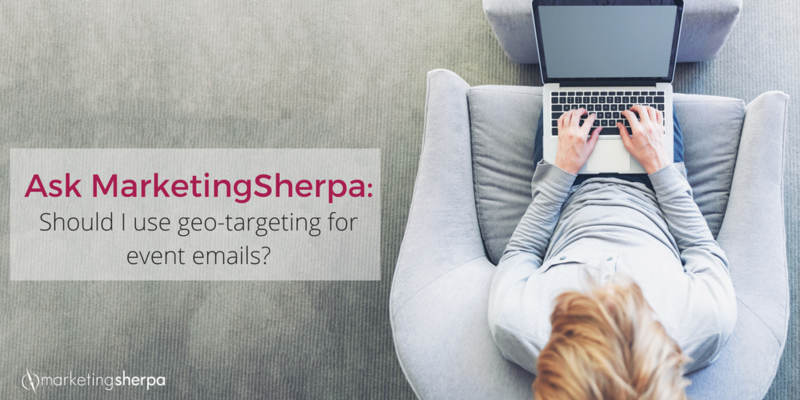 Ask MarketingSherpa: Should I use geo-targeting for event emails? This question was submitted by Email Marketing Manager Korbin in reference to emails about his organization’s events. Korbin: I’m trying to find the average decrease in conversion when we send an event email to a 30-mile radius around the event, versus something larger like 70 miles. It’s caused some heated disagreements between field and HQ staff. Do you have any research on something like this? For example, if an event is in Denver, and we send an email invitation to 30 miles around Denver (~1 hr drive radius), how does that conversion/unsubscribe rate compare to an invitation sent to something like a 50 or 70-mile radius (~2-3 hrs.)? Is it worth expanding the send? Dear Korbin: I asked around the lab and while we don’t have the precise data to support the decision you are looking to make, my colleagues were happy to review and provide their perspectives on your challenge. From running our own events, our hypothesis is that the specific time or mileage would most likely vary by location. For example, here in Jacksonville, we’re pretty spread out, and people are used to going a long way to get places. The same is true in Los Angeles. The Boston market seems way different. Someone isn’t going to come in from Cambridge to get into the city or go from the city out to the suburbs. New York is the same. Leads from our data sciences and research teams shared the results of a campaign they worked on for a large event with satellite host locations. Based on the success of the geo-targeting, this organization then sent the same treatment email to their entire list of subscribers based on IP address, securing an additional 87 registrations. For B2C marketers, the holiday gift-giving season is the time of year when we drive the most revenue. So, to get the most out of the last 24 shopping days of the season, we thought a bit of insight and inspiration from your fellow marketers could be helpful. Here are a few of our favorite tips from ecommerce marketers interviewed at the MarketingSherpa Media Center at IRCE that you can apply immediately to your marketing efforts. Whether you’re working at a startup like Mitch Goldstone, ScanMyPhotos.com, and Gaston Frydlewski, Hickies, Inc., or are part of a larger organization like Mark Friedman, Steve Madden, these tips can be applied to your customer-first marketing efforts this holiday season and throughout the upcoming year. “When someone receives their order, their digitized photos, they [become] my marketing team,” said Mitch Goldstone, CEO, ScanMyPhotos.com. Since ScanMyPhotos.com digitizes physical photographs, Goldstone and his team are often privy to a very personal aspect of their customer’s lives, their old family photos. Because of this, it is important to the team that they humanize the customer experience as much as possible. Watch the full interview below to learn how thinking outside the box when it comes to customer service (sending flowers along with completed orders), has resulted in ScanMyPhotos.com customers becoming brand advocates and content contributors. Are you getting the most out of those blog and social media posts that your brand is tagged in? Is there really a better way to advertise your product than letting your customers do your bragging? Take a note from the playbook of Mark Friedman, President of Ecommerce, Steve Madden, and make sure you’re using this user-generated content to its fullest extent. Marketing 101: What is the rule of thirds? The rule of thirds is one of the first principles that all graphic designers, videographers, photographers and other creative roles learn. It’s a basic guideline for framing and image composition that results in the viewer seeing a balanced, more naturally flattering image. The rule states that the audience’s eye is naturally more drawn to the areas of the image nearest the intersection points. 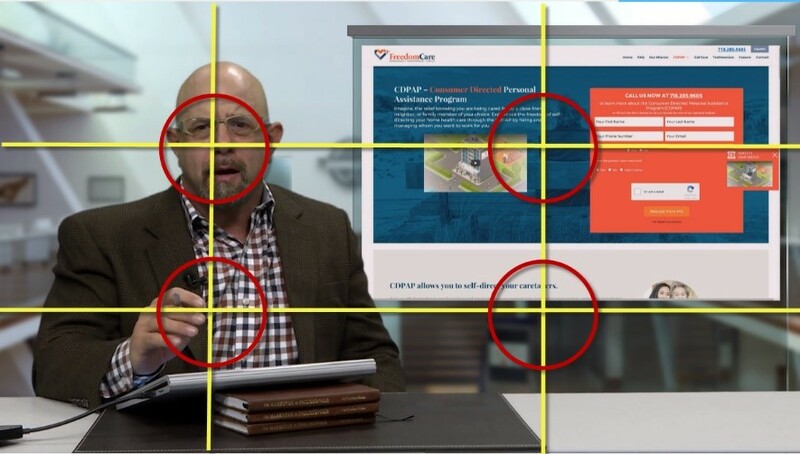 So, when you’re designing an image for a landing page, a social post, a PowerPoint slide, or even if you’re shooting a video, be sure to put the most important pieces of your image near these intersection points. Here is an example of a video frame from one of the most recent recent Quick Win Clinics published by our sister company, MarketingExperiments. The Quick Win Clinic series helps marketers with problems that are easy to solve but difficult to detect. Every week, Flint McGlaughlin, Managing Director, MECLABS Institute, takes a page submitted by the audience and optimizes it on the fly. The primary piece of information we’d like the audience to see in this image is the person speaking, in this case, Flint McGlaughlin. You can see that Flint’s eyes are framed near the top left intersection point. As people, we are taught to look into the eyes of another person when talking to them. So framing an image so that a person’s eyes are near one of the points where the audience’s eye is naturally drawn makes a lot of sense.